There is often a question of whether or not the emergence of pop/rock musicals is a trend or a new part of the business that is here to stay. Many educators argue that pop/rock musicals are mainly relegated to Broadway and that outside of New York, the majority of shows are still legit or traditional style. I presented this information in February of 2011 at the Indiana University New Voice Educator’s Symposium and am posting the data here for your consideration. I analyzed the shows within various categories classifying them as either Legit (classical voice based musicals: Phantom, My Fair Lady, Light in the Piazza, etc. ); Traditional Style (shows written in the traditional jazz based style: 42nd Street, Dirty Rotten Scoundrels, Chicago, A Chorus Line); Contemporary Pop (Shows written with a pop music influence but more traditional in compositional style and book: Anything Jason Robert Brown, Lion King, Little Mermaid, Everyday Rapture, Wicked); and finally Pop/Rock (musicals either jukebox based, heavily pop/rock influenced such as Hairspray, or strictly pop/rock based shows such as American Idiot or Rock of Ages). For comparison, I have chosen to group Legit and Traditional together and Contemporary Pop and Pop/Rock together in my comparisons. The chart above gives data for the shows on Broadway during the 2009-2010 season. As you can see above, 61% of musicals were pop/rock based. Equity Tours which are the highest professional level of Broadway touring shows were 72% pop/rock based and 38% traditional. Non-Equity tours which are often some of the first entry level jobs college graduates will take on were 58% Pop based and 42% Traditional. The Southeastern Theatre Conference auditions are one of the first major “cattle calls” that students attend. Over 1000 performers audition for 60-80 theatres, theme parks, and cruise ships from around the country to be considered for summer and year round employment. Students often begin applying to audition during their sophomore year of college. For these auditions the split was the most even at 50% Pop and 50% Traditional. The Unified Professional Auditions are similar to the Southeastern Theatre Conference however professional level and Equity performers receive priority. 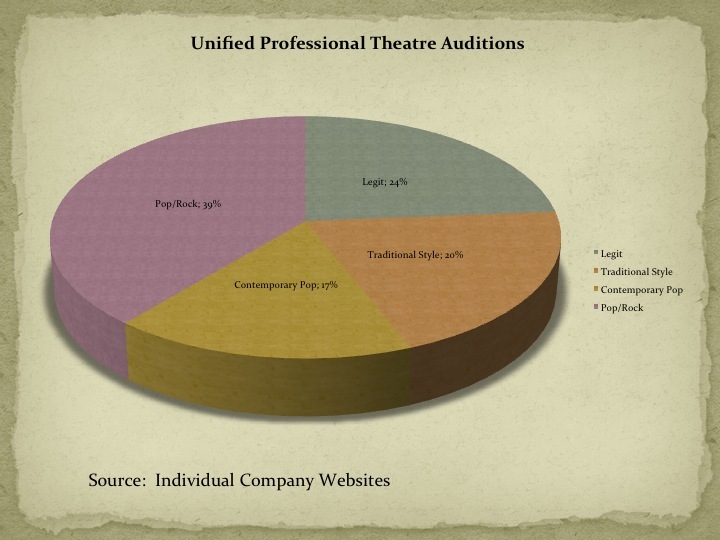 For these auditions, 56% were Pop, 44% Traditional. Finally the upcoming Broadway shows as posted on Playbill.com show that in the next few years we will be seeing 67% Pop and 33% Traditional. Overall, my research found that 58% of shows in these categories were Pop/Rock based. If you ask me, the numbers are hard to argue with. This is not a trend, its the new model for musical theatre, and its here to stay and if you want to compete successfully in the business, you need to know how to sing the pop/rock rep successfully.